Get a digital group caricature with worldwide delivery, which will make an incredible surprise and gift for those who can even do not expect it from you. 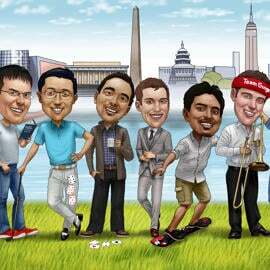 Group caricature will be designed in full body type and in colored digital style, which allow us to create the unbelievable concepts of custom caricatures. Custom Group Caricatures can be drawn in honor of any occasion, for example someone's Birthday, Thanksgiving Day, Christmas or another one of your choice. There are not any idea, which we could not to explain in custom group caricature. Describe any ideas of the custom caricature below by attaching photographs of high quality with clear skin and eyes colors. Digital Caricature will be delivered as printable JPG File of high quality on submitted Email. Digital Caricature is printable on any surface. We offer additional suitable delivery options at extra cost: Caricature printed on Canvas, Photo Paper or mug. Worldwide shipping is available.